I missed an anniversary at the end of last year, and only found out about it by reading the Correo del Sur website – the local newspaper in Sucre. I didn’t realise that the station had been going so long! The reason I am particulary interested is that this is the radio station that I gave an interview at when I was in Sucre many years ago. 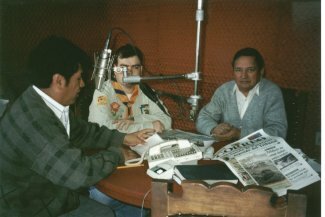 At the time I had been learning Spanish for about 18 Months and the interviewer asked me about my trip with the Scouts to Bolivia. I am pleased to say that I was able to understand most of what he was asking, but he professionalism showed through when he asked me something that I didn’t understand and was able to read in my eyes that was having trouble with the question. Before I even had a chance to say anything, he rephrased it and hopefully the listeners did not even notice. I was so proud to have given my first Spanish press interview! So, even if it is a bit late: ¡Feliz cumpleaños, Radio La Plata! You are currently browsing the Amigos de Sucre blog archives for January, 2009.